Say goodbye to the last remnants of summer this March with affordable flights during the first two weeks. The time to book that local break is now! Flight prices are elevated on most routes from the 15th and onwards as the school holidays start. Even full-time employees can enjoy some free time with a public holiday, Human Rights Day, on the 21st of March 2019. Travellers on a tight budget would do well to avoid booking flights on weekends, specifically after the 15th of March 2019 as those flights are the most expensive on most routes. Budget-conscious travellers would do well to book mid-week flights during the first two weeks or can consult the full calendar below for specific dates on their route. Kulula flights from JNB (OR Tambo) to CPT: Monday and Tuesday flights are the most affordable on this route. Kulula flights from Cape Town to JHB : Sunday flights are slightly more expensive than flights on other weekdays. 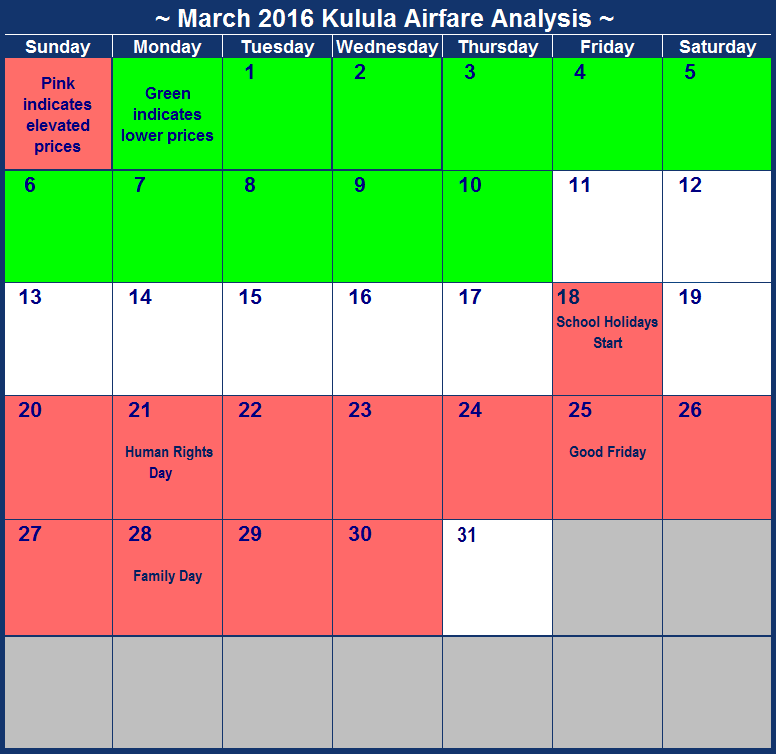 Kulula airfares from Lanseria to Cape Town : Avoid travelling on dates highlighted in pink if you are on a tight budget as those are the most expensive dates to travel on. Kulula flights from CPT to Lanseria : Cheap flights are readily available between Tuesdays and Thursdays. Kulula flights from JHB to Durban : Flight prices are fairly consistent throughout the month and budget-conscious travellers need only avoid the 16th. Kulula flights from JNB to George : Try not to travel between the 15th and 23rd of March as those flights are the most expensive. Kulula flights from George to JNB : Weekend flight prices are slightly elevated, especially after the school holidays start. Kulula flights from CPT to Durban : Flights are slightly more affordable in the week before the school holidays start. Kulula flights from Durban to CPT : Flight prices are incredibly expensive this month, with the cheapest flight being on the 12th. Kulula flights from JHB to East London : Affordable flights are readily available throughout the month as indicated below. Kulula one-way flights East London - JHB : Avoid travelling on dates highlighted in pink below as those are the most expensive days to travel on. 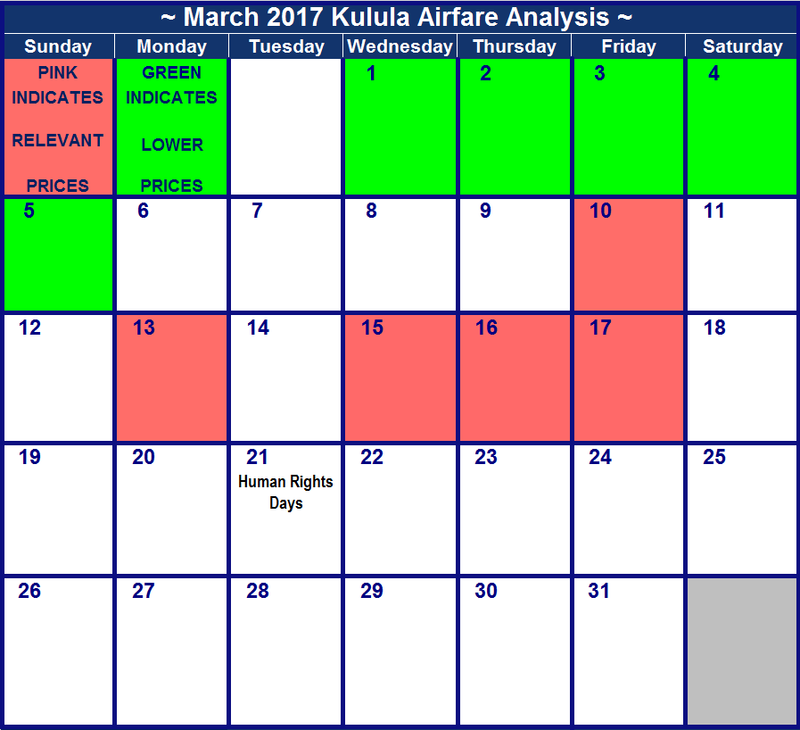 Kulula flights from Lanseria to Durban : Passengers on a tight budget should avoid booking flights for dates highlighted in pink. Kulula one-way flights Durban to Lanseria : Affordable flights are readily available on Tuesdays, Wednesdays and Thursdays as indicated below. The survey was completed on the 18th of February 2019 and is subject to change and availability. Find out how to save during this peak travel period by looking at our detailed calendars below. School holidays start on the 28th of March 2018 and the 30th of March is Good Friday. If you are looking to travel on a budget, it is worth looking at dates well before then. Flight prices start increasing during the second half of the month, with the most expensive dates to travel on being the 28th, 29th and 30th of March 2018 on most routes. Exceptions include flights from Cape Town to Lanseria and flights from George to Johannesburg. 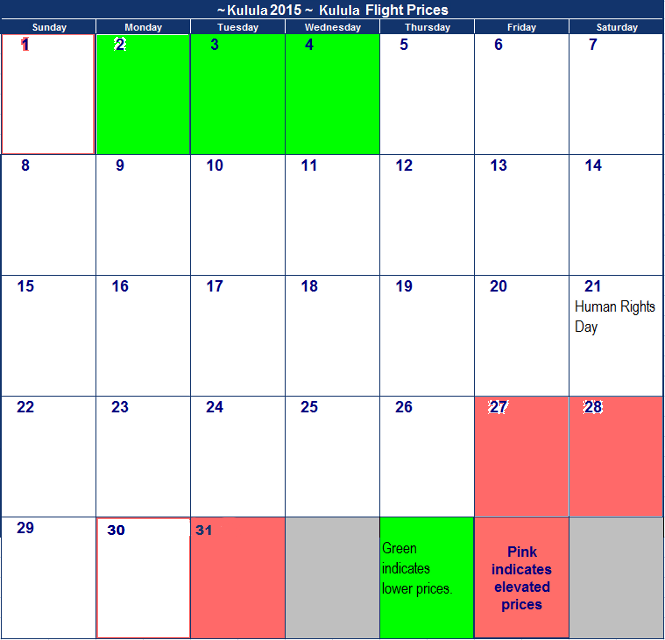 Save some money for Easter eggs by booking flights on dates highlighted in green below! Kulula flights from JNB (OR Tambo) to CPT: If at all possible avoid travelling on the 29th of March 2018. Kulula flights from Cape Town to JHB : Thursdays and Fridays will be the cheapest days to travel on. Kulula airfares from Lanseria to Cape Town : Flight prices increase when the school holidays start on the 28th. Kulula flights from CPT to Lanseria : Affordable flights are readily available throughout the month, with the only date to avoid being the 12th. Kulula flights from JHB to Durban : The 1st 2 weeks of the month is the cheapest to travel. Price increases from the 15th. Kulula flights from Durban to JHB : Avoid travelling during the second half of the month where possible. Kulula flights from JNB to George : Flight prices increase dramatically towards the end of the month, with the 28th and 29th being particularly expensive. Kulula flights from George to JNB : Flight prices are fairly consistent throughout the month with the only exception being the 25th. Kulula flights from CPT to Durban : The cheapest flights are on the 6th and the 7th. Avoid travelling in the last week of the month. Kulula flights from Durban to CPT : Avoid travelling on the 29th as flights are incredibly expensive around Good Friday. Kulula flights from JHB to East London : If you're travelling on a budget you should do so during the first three weeks, on dates highlighted in green. Kulula one-way flights East London - JHB : This is a budget-friendly flight route for the peak season with flight prices incredibly consistent throughout. Kulula flights from Lanseria to Durban : Travel before the 15th to save on flight costs. Kulula one-way flights Durban to Lanseria : Save on flight costs by travelling during the first half of the month. The third month of the year finally presents us with a much-needed public holiday. The 21st, Human Rights Day, falls on a Tuesday giving members of the work force a good excuse to take leave on the Monday and create a long weekend! It unfortunately also translates to more expensive flights. If you are on a budget however, you'll likely benefit more by booking your flights during the first week of the month as that is the cheapest time to travel on most routes. Look out for budget-crunching dates highlighted in pink. Kulula flights from JNB (OR Tambo) to CPT: If at all possible try to avoid travelling Thursdays, Fridays and Saturdays. Kulula flights from Cape Town to JHB : The 1st week of the month is the cheapest to travel. Kulula airfares from Lanseria to Cape Town : The 1st week of the month is the cheapest to travel. Kulula flights from CPT to Lanseria : The 1st week of the month is the cheapest to travel. Avoid travelling on the 13th. Kulula flights from JHB to Durban : The 1st week of the month is the cheapest to travel. Slight price increases on the 17th and the 31st. Kulula flights from Durban to JHB :The 1st week of the month is the cheapest to travel, as well as the 24th. Kulula flights from JNB to George : The 1st week of the month is the cheapest to travel. Avoid travelling on the 17th. Kulula flights from George to JNB : The 1st week of the month is the cheapest to travel. Avoid travelling on the 21st. Kulula flights from CPT to Durban : The cheapest flights are on the 1st, 7th, 8th, 23rd, 28th and the 29th. Avoid travelling on the 12th and the 26th. Kulula flights from Durban to CPT : The cheapest flights are on the 1st, 7th, 13th, 14th, 23rd, 25th, 27th and the 29th. Avoid travelling on the 10th and the 17th. Kulula flights from JHB to East London : The 1st week of the month is the cheapest to travel. Avoid travelling on the 17th and the 18th. Kulula one-way flights East London - JHB : The 1st week of the month is the cheapest to travel. Avoid travelling on the 21st, 22nd and the 26th. Kulula flights from Lanseria to Durban : The 1st week of the month is the cheapest to travel. Avoid travelling on the 16th, 17th and the 31st. Kulula one-way flights Durban to Lanseria : The 1st week of the month is the cheapest to travel. Avoid travelling on the 21st..
March is a busy month for South Africans with Easter weekend from the 25th until the 28th, the start of the school holidays on the 18th and Human Rights Day on the 21st of March 2016. Where possible, travellers should try to make arrangements to fly before the 18th of March when prices increase drastically. The most expensive travel dates include the 18th, 19th, 24th, 25th and the 27th, 28th and 29th, depending on the route. It is generally cheaper on most routes to travel within the first two weeks of the month. Flights have been surveyed on the 26th of February 2016. Kulula flights from JNB (OR Tambo) to CPT: If at all possible try to avoid travelling on the 23rd and the 24th as those are by far the most expensive. Kulula flights from Cape Town to JHB : The 10th is the cheapest date to travel on this entire month. Kulula airfares from Lanseria to Cape Town : Flights on the 4th and 24th are the most expensive. Kulula flights from CPT to Lanseria : Avoid travelling during the last week of the month as prices are incredibly inflated. Kulula flights from JHB to Durban : The only date to avoid travelling on when possible is the 24th of March 2016. Kulula flights from Durban to JHB : Flight prices are quite consistent throughout the month. Kulula flights from JNB to George : Don't travel after the 18th of March and the start of the school holidays if possible. Kulula flights from George to JNB : Rather travel during the first half of the month if possible, and avoid travelling on the 28th and 29th. Kulula flights from CPT to Durban : Prices are inflated around the start of the school holidays and Easter, so travellers might choose to avoid travelling on the 18th, 19th and 20th of March 2016. Kulula flights from Durban to CPT : If possible travellers should fly on the 5th, 14th and 15th to save on flights. Kulula flights from JHB to East London : Don't travel between the start of the school holidays on the 18th and Human Rights Day on the 21st if possible. Kulula one-way flights East London - JHB : Try not to travel after Good Friday as those flights are slightly more expensive. Kulula flights from Lanseria to Durban : Avoid travelling on the 18th of March if possible. Kulula one-way flights Durban to Lanseria : Where possible travel on the dates highlighted in green. This year there are no long weekends in March. The public holiday, Human Rights' Day, . falls on the 21st which is a Saturday. If you are however planning to take a break during March or you are planning a business trip, then the survey below might help you save money on flights. Please note that the below list of 1-way flight prices was set up on the 23rd of February 2015, and airfares may have changed since (the longer it is since the date the airfares were set up, the greater the chance that prices have changed). Check at Kulula what the latest airfares are; and click here to see whether there are any flight specials on the go at the moment. Kulula flights from JNB (OR Tambo) to CPT: Try flying during the middle of the week. Try avoid flying on Saturdays if you can. Kulula flights from Cape Town to JHB : There are some competitive prices available on Saturdays, but try aviod flying on a Sundayif you can. Kulula airfares from Lanseria to Cape Town : There are very competitive airfares available during the entire month. Try aviod flying on a friday if you can. Kulula flights from CPT to Lanseria : You will be paying R886 for a flight 70% of the time in March on the CPT - Lanseria route. Kulula flights from JHB to Durban : R612 is the cheapest airfare that we could find in the month. We found 25 dates that had flights for R704. Kulula flights from Durban to JHB : Prices are very consistent throughout the month. Kulula flights from JNB to George : Avoid flying on the 27th and 30th of March. Kulula flights from George to JNB : If you can please do try and avoid travelling at the beginning and end of the month as prices are elevated around those dates. Kulula flights from CPT to Durban : On this route customers should also try and avoid flying at the beginning and the end of the month. Kulula flights from Durban to CPT : Prices are much higher on the 5th and 6th of March. Kulula flights from JHB to East London : Only 5 days in the month where the cheapest airfare is not R909. Kulula one-way flights East London - JHB : Travellers should only try and avoid flying on the second of the month. Kulula flights from Lanseria to Durban : Don't travel after payday because airfares are generally higher. Kulula one-way flights Durban to Lanseria : Try avoid flying over the weekend.